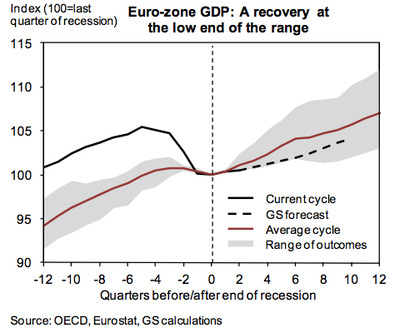 The chart from Goldman below shows just how weak the Eurozone’s recovery has been so far vs. past economic recoveries. It also highlights Goldman’s forecast that the zone’s economic growth will be rather pitiful going forward. Recent GDP data has confirmed that the Euro-zone recovery, which commenced in the latter half of 2009, has been characterised by a clear divergence in the components of aggregate demand, with domestic demand continuing to languish and net exports stepping in as the main driver of growth. Previous Euro-zone recoveries have featured similar compositional asymmetries, but the outsized declines in private consumption and investment this time around place the current recovery on track to become one of the slowest on record. Barring a rapid acceleration in domestic demand over the next two quarters, external demand will have to continue singlehandedly to sustain the recovery, with only limited support from the inventory cycle. Overall, recent developments are broadly consistent with our existing Euro-zone forecast, and translate into rather muted sequential GDP growth of 0.3%-0.4%qoq throughout 2010. The chart above is probably worth taping to your desk, to keep things in perspective. There is little room for error right now given the weak growth prospects already expected as it stands.